Per ANSI Standards Section 9 all Electrical Switchboards should be tested and inspected once every year. 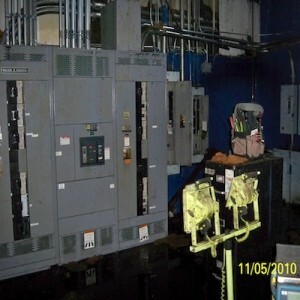 During this inspection Cooper Electric will properly remove all dirt and debris from the electrical enclosures. It is important that the electrical equipment is vacuumed out. As opposed to using an air compressor. (Applying compressed air to the equipment will only disperse the dirt for a short while and may allow conductive particles to come in contact with energized parts which could result in a ground fault.) All debris removed from the electrical equipment will be removed from the facility and properly disposed. Our Licensed Electrician will visually inspect all electrical equipment for any National Electrical Code violations, equipment abnormalities, and "good-practice" recommendations. 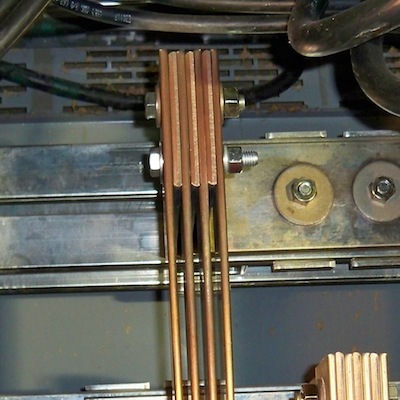 Common violations found in switch gear are: improperly grounded circuits, double tapped circuit breakers (where lug is only rated for one single conductor to be terminated), and abandoned holes or openings (which allow debris into the cabinets). The visual inspection will also reveal signs of heat, discoloration, melted insulation or plastic, and even electrical arcing. 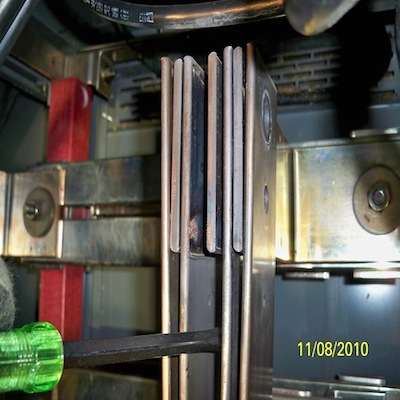 All issues from the inspection will be documented and reported to the facility contact in a report. 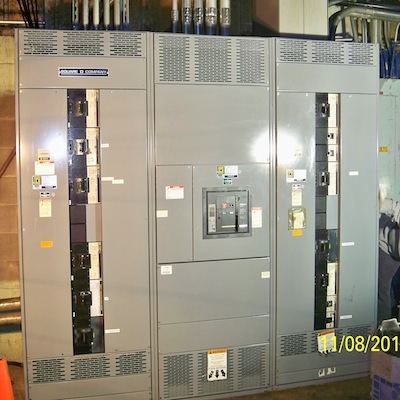 An Infrared Inspection has been performed on the Main Electrical Equipment located on the Service Level, the UPS room located on the Basement Level, all electrical rooms located on Floors 1 thru 26, the Mechanical rooms located on Floors 12 and 27 and the Penthouse located on the rooftop. All Electrical Panels, Electrical Disconnects, Main Distribution Equipment, Motors and Overhead Bussway were inspected by our Thermographer and any National Electric Code Violations or General "Good Practice" Recommendations are listed below. MAIN ELECTRICAL ROOM ON SERVICE LEVEL should be inspected and exercised on an annual basis per ANSI Section 9.3 and 9.5.1. All circuit breakers located at the Main Service should be exercised and tested including the Bolted pressure switch. FLOOR #3 in the South Closet the disconnect cover is not properly installed and need to be fastened to the enclosure. This is a safety violation if someone was to remove the cover. SERVICE LEVEL 1A/1B Air Handler Capacitor unit is not working properly. The Capacitors have zero current draw and the amber lights are illuminated to alert a problem. FLOOR #21 panel mounted on the East Wall is not properly supported and pulling away from the wall. Also all grounds should be terminated using a TA-2 lug and removed from the support. FLOOR #27 in the Penthouse NO II Capacitor Unit Phase A has zero current draw and the amber lights are illuminated to alert a problem.